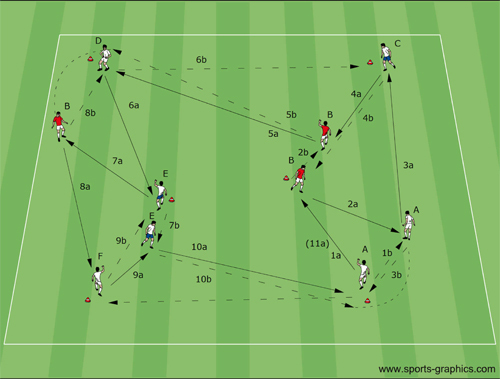 Soccer drills from the DVD “Attacking Soccer” combine fast pass sequences, wall passes and overlapping. 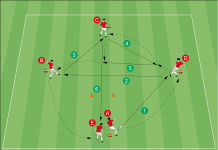 Players sprint from one position to the next, which requires them to pay careful attention to running paths and passing lanes. 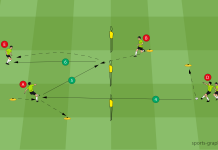 This soccer drill begins with a wall pass followed by a through pass. 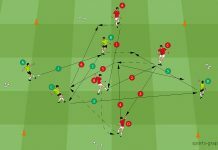 Very important is the concentration on what to do before receiving the ball, to do with the ball and what to after passing the ball.